Numerous approaches to studying globalization co-exist in global research of the phenomenon, which is perfectly understandable, as the multitude of its manifestations permeate nearly all spheres of human life from the individual level to the whole world. 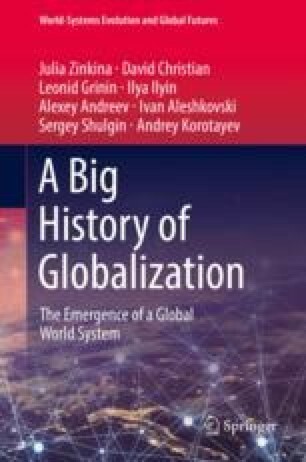 In this book we choose to view the history of globalization along the Big History lines, tracing the increasing complexity of trans-border interactions and flows paralleled by the emergence and spread of global institutions and processes. In this chapter, which concludes the book, we challenge ourselves with fitting the first four periods of the history of globalization (from its earliest signs coming with the Neolithic Revolution to the first “golden age” of globalization in the decades prior to World War I) and their major innovations and watersheds into ten pages.